Here I am, reflecting already. Perhaps not so much on the learning or the culture, but still, I am reflecting. On a subject that is probably quite important to us all, but one we, in Canada, may take for granted. Sometimes, when we use a public “washroom” at home, we may be cranky because the toilet paper is not of a high enough quality, or there are not enough stalls, or perhaps they have run out of paper towel or something. But there are certain things you can count on. Seems pretty basic, right? Not an added luxury or anything. Well, in many areas of Europe, it apparently is a luxury, and one not often bestowed on us frequent users of public toilets. The holes on the back of the toilet in which the screws should be, holding the seat in place, are there, but no seats. Why? It is unpleasantly cold and uncomfortable to sit on the rim of a toilet, and very nearly impossible to squat over it. So, what’s it all about? Is it a conspiracy; all the Europeans got together and decided to remove the seats as some twisted practical joke? We would walk into a Motorway Services WC, and if it was really clean and modern, we would breathe a sigh of relief. Until we opened the stall door and realized the seatless toilets are not just a feature of old, outdated, or rundown bathrooms. They are also prominent in the newer ones. I cannot understand it. But what I understand even less is a public bathroom without soap. We came across many. And I don’t mean the dispenser had run out of soap, I mean there was no dispenser to begin with. This is not just uncomfortable, it is disgusting. Unhygienic. Unhealthy. Gross. 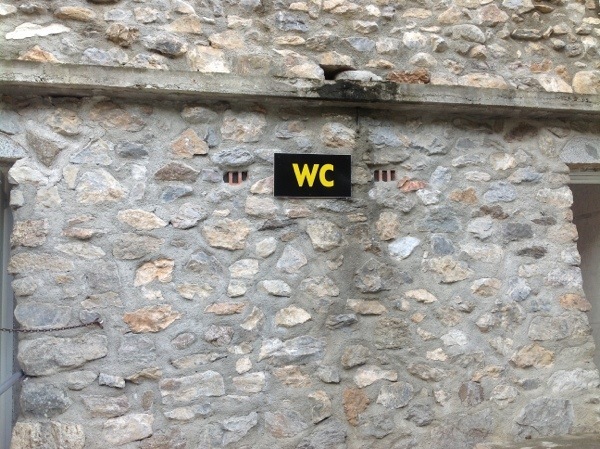 But not quite as gross as the toilets we encountered just outside the Mont Blanc Tunnel, on the border of France and Italy. Yes, the classic and ought-to-be-long-forgotten holes in the floor. We had been driving about five hours when we got to these ones, and it was only our second day on the Continent. It did not bode well for the remainder of the trip, but thankfully this was our only altercation with these archaic toilets. Or could you actually call them toilets? Not really, I suppose. A toilet is an actual thing, whereas these are just the absence of a thing. Even after five hours in the car, one of our children simply refused to use these. And really, who can blame her? I mean, in this day and age, there’s just no need for it, is there?